TriDerma® is a line of true skin care products made with Certified Genuine Virgin Organic Aloe, moisturizers, and other carefully selected ingredients to target and help heal a wide variety of skin problems. In its mission to create the perfect healing formulations for specific irritations, TriDerma’s true products are made using only the finest quality, hand-selected ingredients. TriDerma is passionate in its pursuit to create truly fast healing, natural formulas that do not cause harmful side effects. What is TriDerma® doing to help? A respected leader in the medical skincare field, TriDerma® has generously offered to support the ACCO mission by donating 20% of their proceeds (between August and October 2015) from sales of the products listed below to the American Childhood Cancer Organization. Each of these five products are formulated to provide relief from many of the common side effects associated with childhood cancer treatments, and to minimize the pain and discomfort children with cancer are forced to endure on a daily basis. TriDerma® is available in major drugstores nationwide and on www.triderma.com. Product Description: Baby Feet® Ultimate Foot Cream smooths, softens, moisturizes, and helps protect against dry, cracked, rough, and callused feet. This powerful skin healing cream provides fast relief for the most severely cracked, dry, crusty feet and elbows. Daily use helps break down dry dead skin cells, supply and retain moisture, and promote healthy baby soft skin. How this product helps: One of the most common requests from children with cancer is for foot massages to moisturize the dry, cracked skin on their feet and lower legs, and to relieve foot soreness after exhaustive cancer treatments. Baby Feet® Ultimate Foot Cream utilizes a combination of powerful skin protectants and skin softeners to heal severely dry and cracked skin, and its creamy, rich formula is perfect to massage sore little feet. 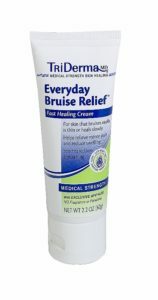 Product Description: This gentle, yet powerful cream provides fast healing and soothing relief for bruises, itching, redness and dryness. Everyday Bruise Relief™ is the perfect cream to help heal skin after cosmetic, esthetic or surgical procedures, including laser, waxing or peels, to help calm and soothe skin. It’s also ideal for those who bruise easily, have thin skin or heal slowly. The specialized formula contains carefully selected healing ingredients, botanicals, rich plant complexes and vitamins for healthy skin. How this product helps: The seemingly never-ending barrage of tests, port placements and removals, blood draws, and IVs take a toll on a child’s fragile skin, often leading to painful, unsightly bruising. Everyday Bruise Relief™ cream is formulated with botanicals, rich plant complexes, and vitamins proven to soothe and heal bruised, irritated, tight, and/or dry skin. Product Description: Recommended by doctors for more than 15 years, this creamy occlusive helps provide fast healing and soothing relief for delicate skin following a cosmetic, surgical or aesthetic procedure. It hydrates and helps relieve skin tightness, scabbing, itching, burning and redness. Use af2ter laser, dermabrasion, chemical peel, thermal burns, facelift or other common procedures on the face or body. The fast-soothing formula is specially formulated with a proprietary AP4® Genuine Virgin Organic Aloe Complex, which naturally contains more than 200 healing properties. It also contains Zinc PCA, Vitamins A, B, D, E, soothing oat protein, moisturizing Shea butter and other advanced healing botanicals to help tender skin recover faster. The non-greasy formula is free of fragrance and parabens, and safe for all skin types. How this product helps: Safe for all skin types, the Post Laser Aloe & Zinc Occlusive™ cream is formulated with a propriety combination of Zinc PCA, Vitamins A/B/D/E, soothing oat protein, moisturizing shea butter, advanced healing botanicals, and AP4® Genuine Virgin Organic Aloe Complex, which naturally contains more than 200 healing properties. This cream is ideally suited for the treatment of tight, scabbing, burning, itchy, inflamed, or tender skin—all of which are common side effects of many childhood cancer treatments. By providing crucial hydration, this rich, smooth recovery cream expedites the healing process and soothes the skin after your child’s treatment sessions. Product Description: This doctor-recommended unique skin healing cream helps soothe, heal and minimize the skin damaging side effects from radiation therapy. Daily use helps peeling, redness, burning and skin discoloration. Plus, it helps provide fast relief and soothing comfort for damaged skin. Radiation Skin Relief cream contains a highly concentrated healing system that combines multiple natural botanicals, extreme moisturizers, AP4® Genuine Virgin Organic Aloe Complex, plus two clinically proven skin protectants. It is non-sticky, non-greasy, fragrance free and paraben free. Patients should start using the cream a week prior to starting treatment. The cream may be used daily and after each treatment or as directed by a doctor. How this product helps: It is a sad fact that potentially lifesaving radiation therapy (administered to shrink/kill cancerous cells) is proven to cause adverse skin reactions in nearly 98% of patients. 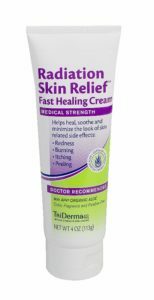 TriDerma®’s Radiation Skin Relief™ Fast Healing Cream was formulated specifically for patients receiving radiation treatments, does not contain any fragrance, color, or parabens, and helps to minimize skin damage while smoothing and ameliorating the discomfort and harsh side effects of radiation treatments. Product Description: Recommended by pediatricians and a must-have for every parent’s medicine cabinet, Scar Block® for Kids is a 2-in-1 healing gel. This gentle, yet powerful dual-action formula contains proprietary AP4® Genuine Virgin Organic Aloe complex plus medical strength Silicone to help skin heal without scarring. Unlike silicone patches that don’t stay on, especially on active kids, this easy-to-use gel provides the protective coating necessary to help promote healing. Scar Block® for Kids helps prevent and minimize scarring for new and existing scars and helps skin irritations heal faster. Safe for use on everyday common skin problems like cuts, knee and elbow scrapes, burns and bug bites to help them heal faster, as well as after the removal of stitches. It combines gentle, yet powerful medical strength ingredients that are known to help reduce scarring. For best results, apply as soon as possible to cuts, scrapes, burns, bug bites or other skin injury to reduce the risk of scarring. Or, use it on existing scars to help improve the appearance of thick, red, pink or raised scars. 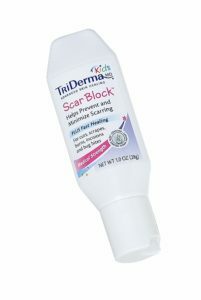 How this product helps: Scar Block® for Kids is a 2-in-1 healing gel that can be used to minimize post-surgical scarring for both new and pre-existing scars, and to help skin irritations heal more rapidly. When utilizing this product as a preventive measure, apply as soon as possible to your child’s skin injury to effectively reduce the risk of scarring.